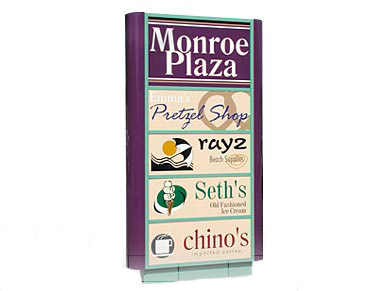 Improve occupancy rates and advertise unique property features with colorful signs and graphics from InstantSign. Informational signage helps you market property even when you're away, while yard signs and building banners let potential tenants know who to contact about buying or leasing. Well-designed signs and graphics draw attention to your commercial properties and promote an image of quality. Illuminated monument signs attract drive-by customers both day and night. Use colorful residential yard signs to increase traffic, communicate important information and make a stronger curbside impression. Use lightweight, curbside signs to list amenities and generate interest in your rental properties. Easily removable magnetic signage puts your message in motion on any vehicle - with no permanent commitment. For a lasting impression, image your vehicles with wraps or full-panel, full color digital graphics. Showcase your business mile after mile! vehicle into a rolling billboard. Well-designed, permanent signage enhances the image and value of your rental properties. An attractive, high-quality building-directory display creates an upscale image for your property and your tenants. Tenant directories improve traffic flow by directing and informing customers. Larger signs are easier to see from a distance, and by adding borders and extra colors, InstantSign can help potential tenants or buyers notice, read, and remember your message. Banners build your business throughout the year. Want to improve occupancy or advertise a renovation? Hang a banner on the outside of your building. Studies have shown that people tend to ignore what has become overly familiar - but a fresh new message reawakens their interest.